Your committee has been busy over the winter and have compiled the full list of past winners of Irish Nationals from 1970 to the present. 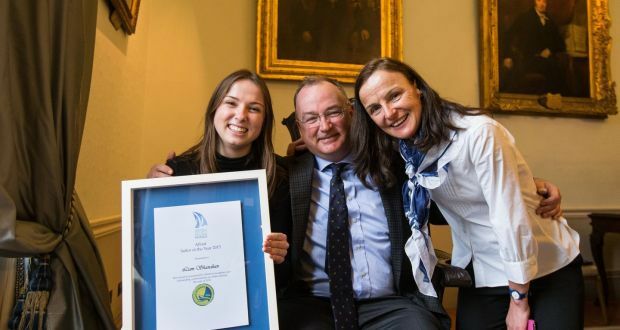 Check it out - GP14 Past Irish Champions - some fabulous family connections. 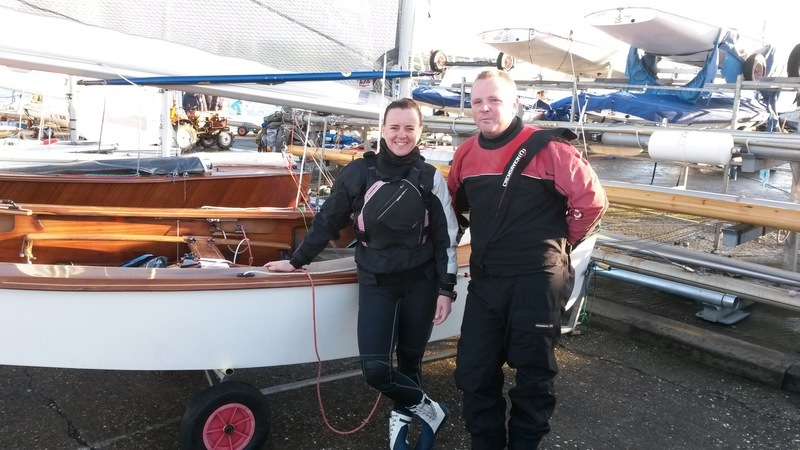 The GP14 fleet sends its congratulations to Colman and family. Colman's reason for not being able to sail in the Worlds in Barbados! 22 Irish GP14s arrived on a drizzly wet Saturday morning at 9am at SureFreight's Yard off the Crumlin Road, Belfast. Many thanks to Michael Rutherford & SureFright for their facilities. Racking was put in place very quickly and the first loads were going in by 9.30am. Hot drinks were flowing with plenty of biscuits and cake to keep the gang going. Unfortunately 1 accident on the day - chief photographer Garth took a trip and ended up in A&E with a fractured wrist. He's hoping the cast is off before Barbados otherwise he's going to have the worst white bits of anyone! Sri Lankan packing experience came in handy and all loading of the boats went smoothly. Fantastic to get the last container door shut with plenty of time to spare. Roll on the sunshine & warm waters of Barbados. The GP14 Ireland team's packing weekend for the 3 containers will be 6-7 Feb 2016. We will be packing the boats in Belfast. Allastair Duffin is renowned for building GP14 'flying machines' but now he is actually building a flying machine. This is an article by Jason Boyd published in Alastair's local paper the Newtownards Chronicle about how he is building a replica of the Harry Ferguson monoplane. 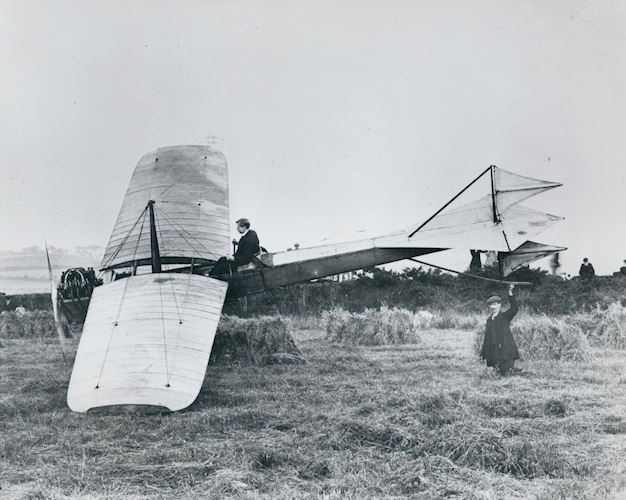 Ferguson was the first Irishman (possibly the first in the British Isles) to build and fly his own plane in 1909. 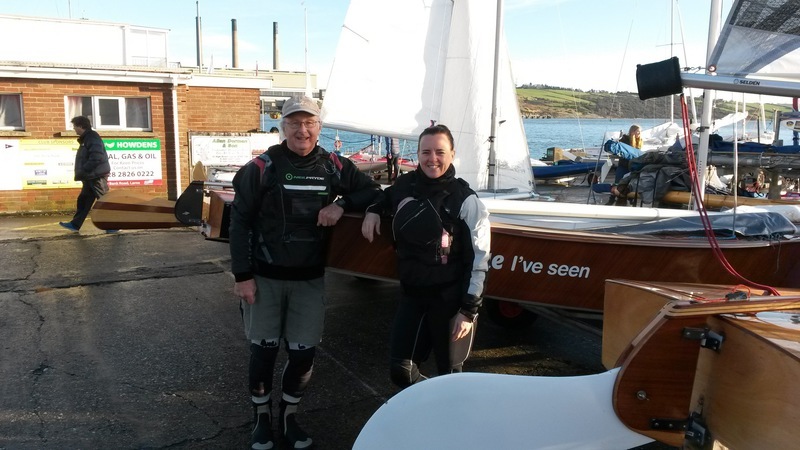 From sea to air, a Newtownards boatbuilder and woodworker says he has been enjoying building a replica of the first aeroplane to fly in Ireland. However, Alastair’s latest construction project is a far cry from his usual seafaring work, which will instead see his creation take to the air. The BBC has commissioned Alastair to recreate the monoplane that Harry Ferguson first built in 1909, and who would go on to become the first Irishman to fly. 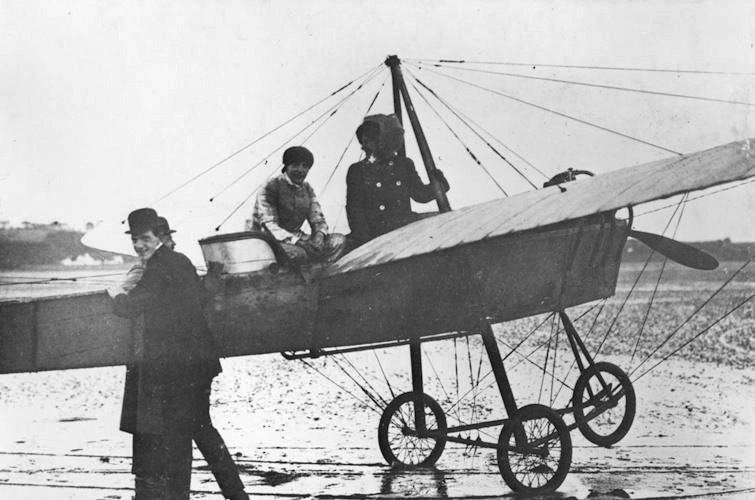 While his name is synonymous with tractors and motorcars, the engineer became enamoured with the exploits of the Wright brothers, who had successfully flown an aeroplane in 1903. After hearing about their achievement he visited exhibitions and air shows, where he jotted down a number of designs. He then returned home to the garage he and his brother Joe ran and they embarked on building and flying planes. 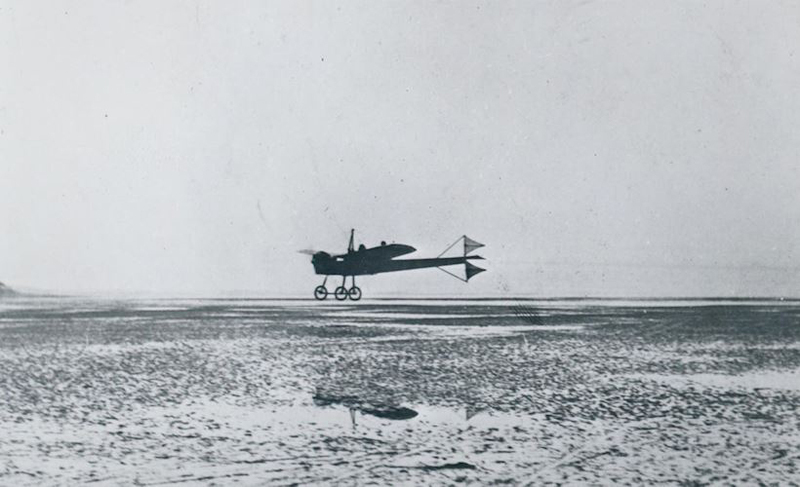 After making many improvements, and a few unsuccessful attempts, one of which was at Magilligan Sands, the Ferguson monoplane took to the air from Hillsborough on December 31 1909. However, while his attempts at Hillsborough and Magilligan are well documented, it is also believed that Ferguson tested his plane at the site of what is now Ards Airfield. When the BBC approached Alastair about a year and a half ago with their idea of filming a documentary about Ferguson, which would include flying a replica of the original plane, he recalled how he felt about the prospect. “Strange,” he said. “It’s wood and I said, so long as you’re only involving me in the wood part. They had a drawing at that stage so I knew roughly what was involved. It’s not that unsimilar to boats. You have frames, you stick them together. There are advantages and disadvantages. When I’m building boats I go on automatic because I don’t have to think about it. Although, Alastair admitted there have already been a number of challenges. The first, and most basic of that was getting the right wood, which, after some discussion, was provided to him. However, once he started working on it, he soon discovered he would have to use his initiative. “There are no original plans,” Alastair said. “From what I can gather, Harry Ferguson marked it out on the floor and said to the men, right, there you are, build it. It must have been a marathon job for the person who drew these.” It will be 22 feet long, with a wing span of 32 feet. The plans were drawn up using a model at a museum as its basis. However, Alastair pointed out that that model was never meant to fly, and so he had to make a number of changes, which included not only gluing the pieces together but screwing them together too. The frame took Alastair around four days to complete and he will spend the next week constructing the wings. The steelwork for it will be made Crosby’s in Holywood and the linen will come from Lisburn. Once completed it is hoped the plane will fly this April. We encourage all sailors to attend as many events as possible. The Goacher sponsored leagues will again be running for 2016. Due to the Worlds in early part of 2016 we are combining the O'Tiarnaigh Challenge & Purcell Trophy into 1 event. In 2016 we are again partnering the Mirror fleet with their Irish Championship being held alongside our Leinster Championship in Sutton DC. 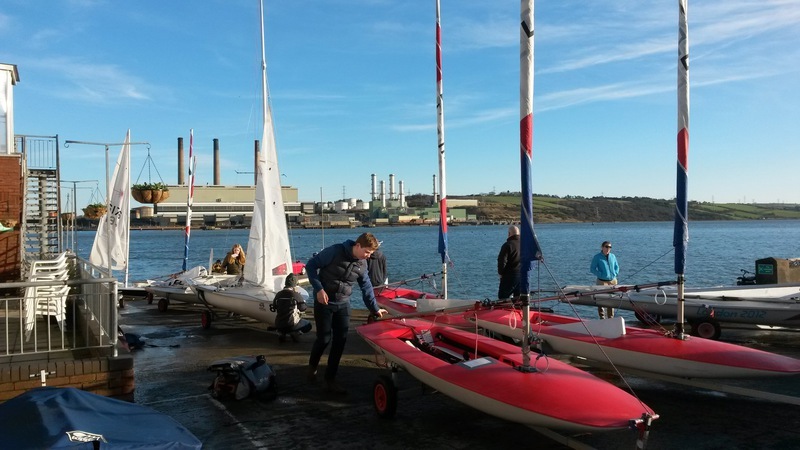 Some Mirror junior sailors in the past have progressed into GP14s but with RS and Laser boats dominating the junior scene in Ireland it is difficult to get the Mirror juniors to progress into GP14s. There will be more to come on the Mirror partnership. 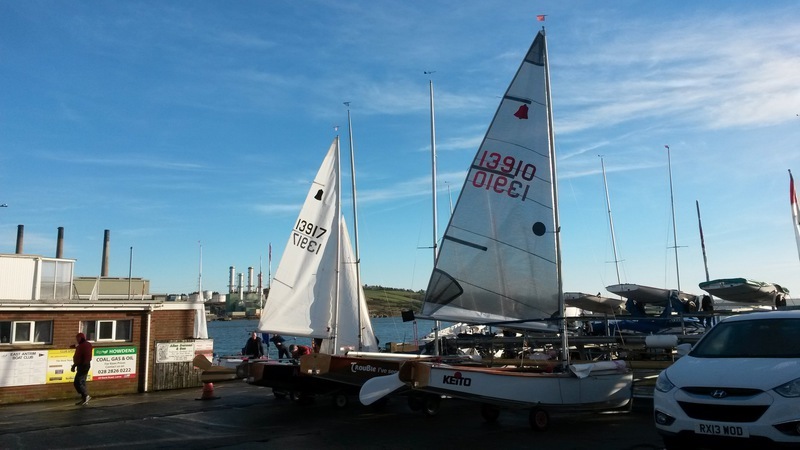 East Antrim Boat Club Christmas regatta was held on Sunday 27th December. 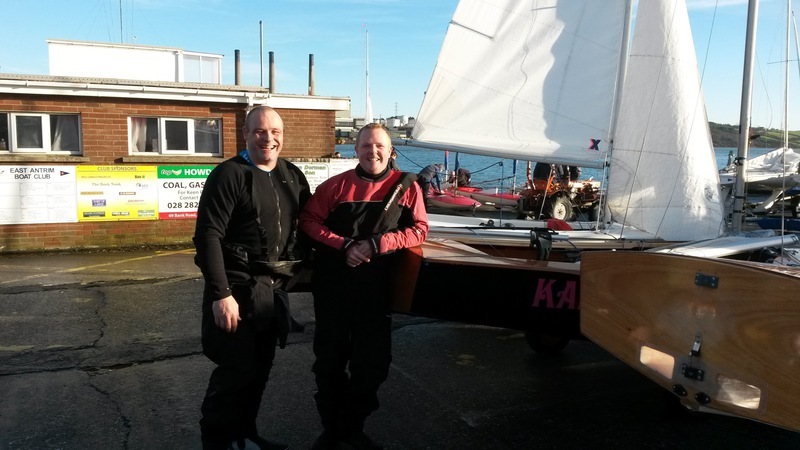 38 multi fleet dinghies set out in bright sun shine and medium airs. A number of Barbados bound GP14ers got their boats on the water for 3 good race paced outings. Locals Curly Morris and Laura McFarland lead the GPers off the start line but got congested in traffic at the windward mark and had to forfeit a 720 penalty to an incoming trapezed 420. This let Stephen & Johnny Nelson into the lead which they carried all the way to the finish with Curly and Laura 2nd, followed by Brian Andrews & John McArthur and Michael Cox & Josh Porter. Very little break was given by OD Richard Doig which the fleet was thankful for as it gave no time to get too cold. The fleet were set off in an oscillating breeze and a turning tide. Curly and Laura lead all the way this time with the Nelson brothers taking 2nd. Josh took over the helm and had a good battle around the Olympic course. By the time the 3rd race was due to start the oscillating breeze had built to the forecasted strong winds and the sailors now had to stretch their muscles a bit further. A good start by all GP14ers but the Nelsons brothers were in their element and powered both up and downwind. Locals Curly and Laura held on well but the final race went to the Nelsons brothers giving them the overall win of the regatta. East Antrim Boat Club put on a great regatta and was a superb training event to get the sailors into shape for the GP14 World Championship taking in place in Barbados Easter 2016. All GP14s welcome, especially those wanting/needing training for the worlds in March. Sligo Yacht Club intend hosting a Gate Start Practice Weekend on 28th & 29th of November. Sligo hopes as many as possible can make it. GP14 Ireland Assoc has 3 containers, with 4 empty slots.